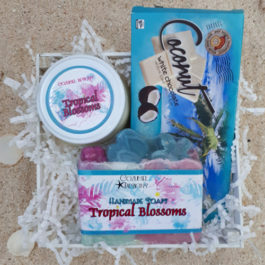 Basics for a trip to the beach with soap and a candle bring the aroma of the Caribbean with you wherever you go. 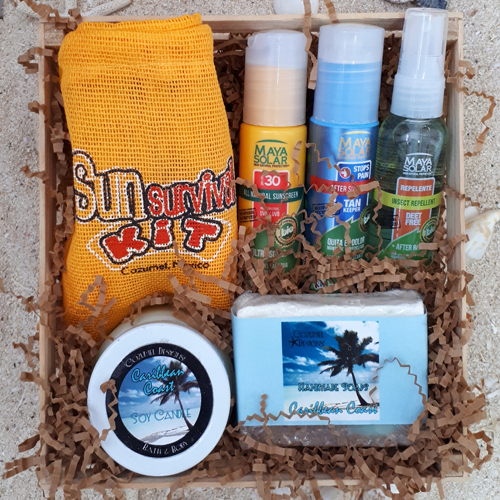 The gift-wrapped basket is filled with a 5 oz Caribbean Coast soap, a 4 oz Caribbean Coast candle, and a burlap Sun Survival Kit filled with 75 ml Sun Block, 75 ml After Sun Cream, and 60 ml Insect Spray. All the Maya Solar products included are hypoallergenic and biodegradable – safe for the flora and fauna in our Cozumel environment. 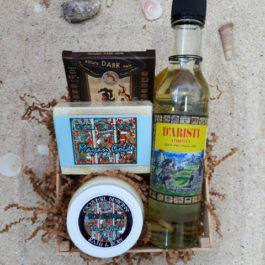 You’ll be nuts for this coconut inspired gift basket. Included is 5 oz of Dulce Coco handmade soap and a 4 oz handmade Dulce Coco soy candle to provide the coconut aroma. 100 gr bars of both Dark Coconut and White Coconut from Kakao Chocolates provide the coconut taste. 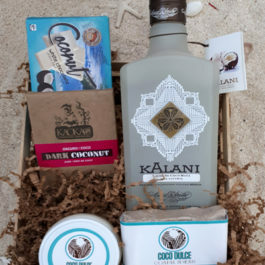 The star of the basket is a 750 ml bottle of Kalani Coconut Liqueur from the Yucatan, a delicious and exotic coconut delight with notes of roasted coconut and lime, followed by dark chocolate and caramel in a velvety smoothness. Red wine and chocolate dominate this large gift-wrapped basket. A 5 oz bar of Fruta de Selva handmade soap and an 11 oz Fruta de Selva Rewind soy candle in a recycled-repurposed wine bottle, add the aroma of sensual jungle fruit. 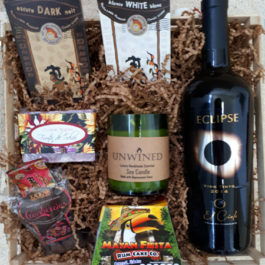 Included are 100 gr bars of Dark and Milk Chocolate plus Chocolate Covered Cranberries from Kaokao Chocolates, a Chocolate Chip Rum Cake from Mayan Fiesta Rum Cakes, and a 750 ml bottle of Eclipse Wine from El Cielo Winery. Eclipse is a mixture of different red grapes aged in French oak barrels to add a smoke-like note to this rich red wine.